Know it all with our detailed product information! Home // Our News Blogs // Know it all with our detailed product information! 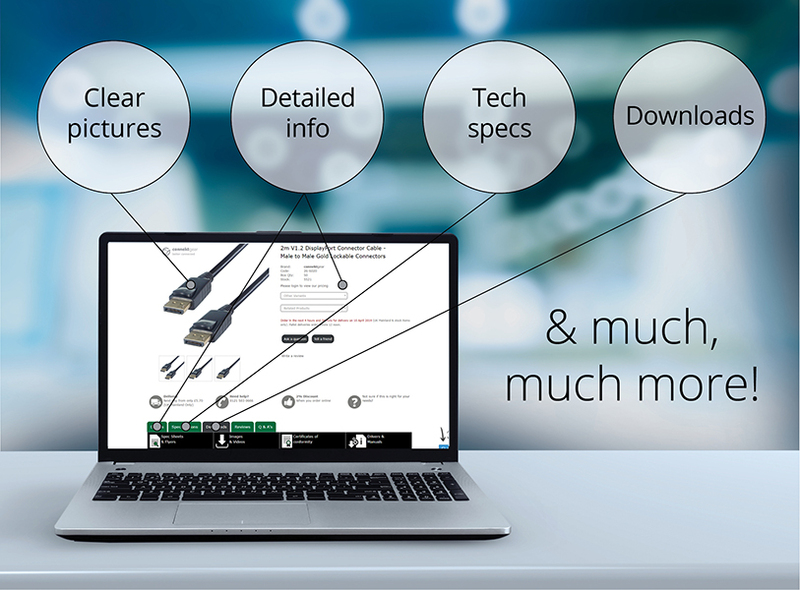 For our new website we focused on making sure that you have all the information you may need to choose a product that will best suit your needs. Of course, you could always contact one of our members of staff through our new live chat feature giving you further help and support whilst you are online, though we understand it is useful to have all the information you need written down in front of you. For you to find the exact product that you may need, within every product page we have included a list of other variants and related products if available. The other variants tab will show you alternative products that may fit your needs better than the one you have already selected. This could include different lengths of your selected cable, or different sizes and styles. The related products tab will offer you different products that may be useful to you based on the product you are currently viewing. To make sure you get your products exactly when you need them, on our new website we have included a countdown that will allow you to see how long you have left to order an item for next day delivery. Please remember our cut off point for next day delivery is 4:30pm, and we understand how frustrating it is to miss the cut off point when you desperately need the products the following day, so we included this countdown to try and avoid that frustration. We have improved the product information sections of our product pages greatly; including more in-depth information about what you are buying, as well as brief descriptions of what the product does and why you could need it. The “Why do you need it?” section will put the product into real-life context, so you can see exactly how you could make use of our products. The “What does it do?” section tells you exactly what the product does in plain terms to make it easier to understand, and to make sure that you are purchasing the correct product. We also included an in-depth list of product details on the front tab of the product information section. We like to make sure you know exactly what you are buying which is why we put this section in plain view. The product details will include things such as; connector types, how the product can be used, what formats the product supports including bandwidth and definition, common names for the cable, and pretty much any extra information that we felt could help you understand our products better. Included within all product pages are a full range of clear images of the product you are viewing. We have included images from different angles, and close ups where necessary (connectors and ports) so that you get a full idea of the product that you are looking at purchasing. You can also download these high-quality images by navigating to the downloads tab on the product’s page. You can now decide to purchase our products without just relying on what we are saying about our products; now you can read other people’s views of our products in the review section of our product pages. You can also leave a review of the product yourself, so if you like a product, please let us know and leave a review on the product page! Your feedback is important to us. Of course, you can view all our product spec sheets, and certificates to your hearts content to ensure you are buying a quality, regulated, and most importantly safe product. The important thing to remember about all this information is that it is all open to you at any time to view, however if you ever need any assistance with finding the information or if you need any extra information that we have not included, you can contact us using our live chat, email us, call us, or by submitting a contact form. It’s all been for you! Everything we have been working on with our new website is to ensure that you have the best possible experience and that it should reflect the excellent customer service that we offer, making our services even more accessible. If you like what you see, leave us a review on TrustPilot or Google, and we’ll send you a voucher code for Free Delivery on your next order!